Folks, this has been a long time pending thread from my end. 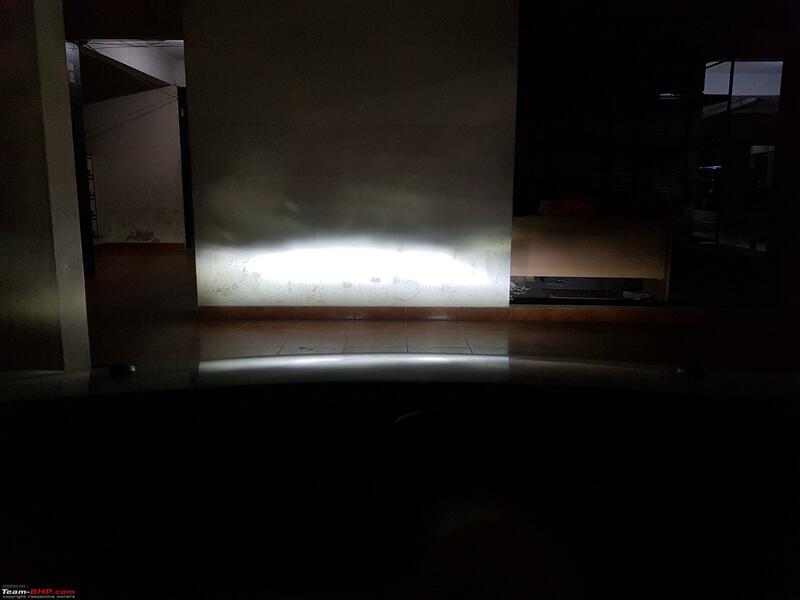 Over the last 1 yr I have tried multiple experiments with LED light upgrades on both my cars Figo and XUV and been wanting to share with the forum. During this time there have been multiple new threads started on TBHP which give lot of information. This thread will add some more details and my story to the same and hopefully let you decide if its the right choice for you. Its a fairly DIY effort depending on the car you have and the space it offers to work behind the lights. So the urge to have white lights aka like the germans has always been there. 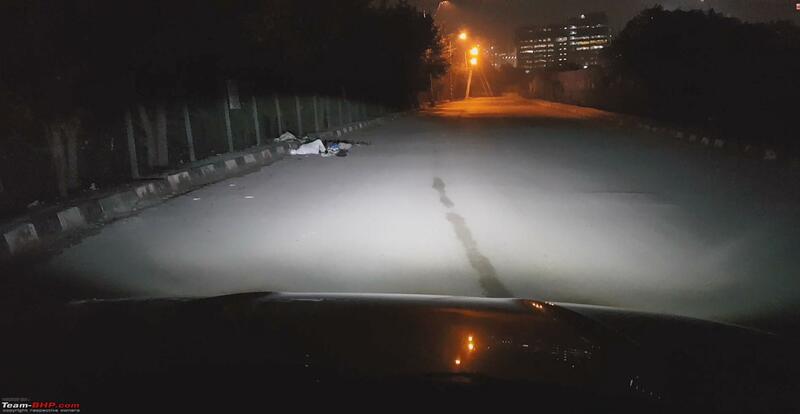 Ignoring the argument about how much white light scatters in rain and fog, there can be no debate that those bright white light looks swell and attractive. Maybe its the punjabi in me which is talking here but little bit of bling doesn't hurt. Also my liking to tinker a bit on my own with the car also made this an attractive proposition. Thanks to a colleague of mine whose i20 i spotted first with upgrade seeded this idea. Before I bore you with more details and verbose. Let me share some pics for you to see the results and hopefully will ans most of the questions. Let me start with the Figo upgrade. 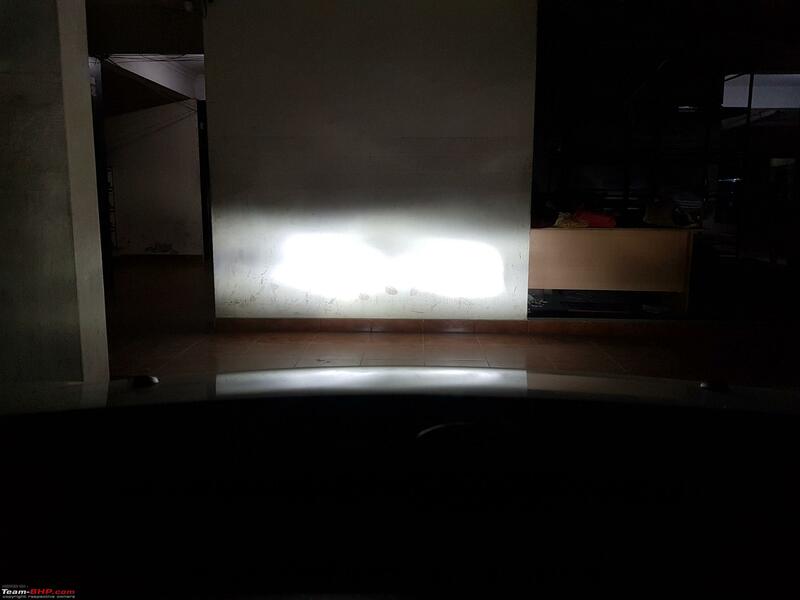 Figo has H4 bulbs and given my prev gen model it had really poor headlights. I chose the same H4 brand that my colleague had on his i20 elite. In the above pics you can see despite the fan on the back the light fits well and the dust cap was easily tightened without an interference. 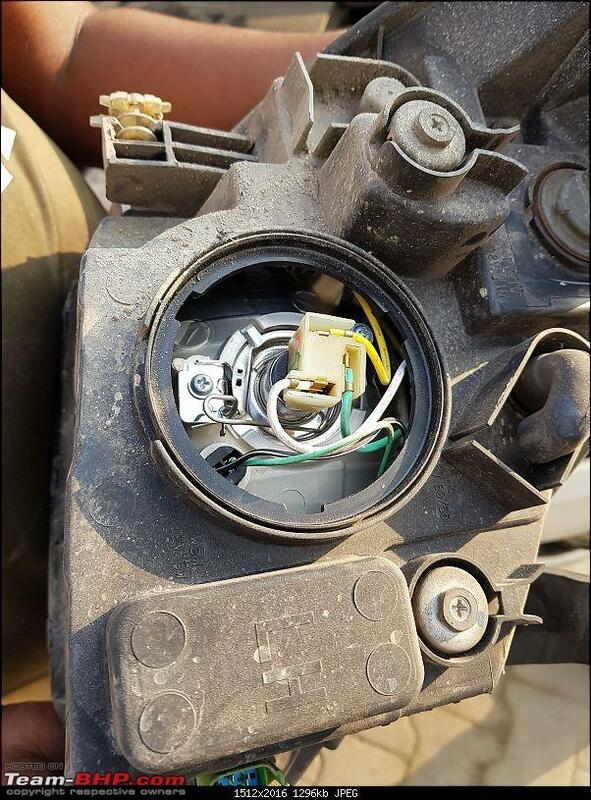 The power supply for the light goes within the casing of the headlight and doesnt cause much complexity in the fitment. 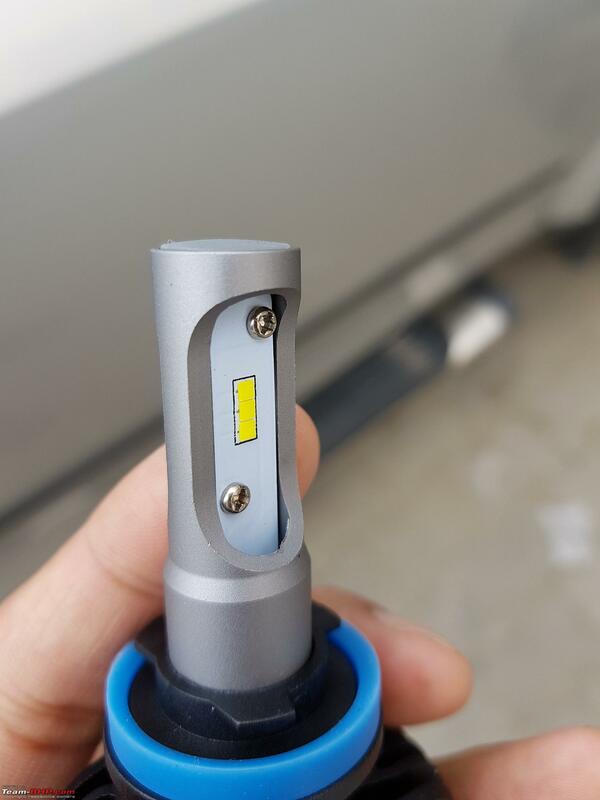 A point to note that all these LED lights come with a H4/7 etc shaped ring which needs to be fixed in place of the bulb and locked down with the metal clip. 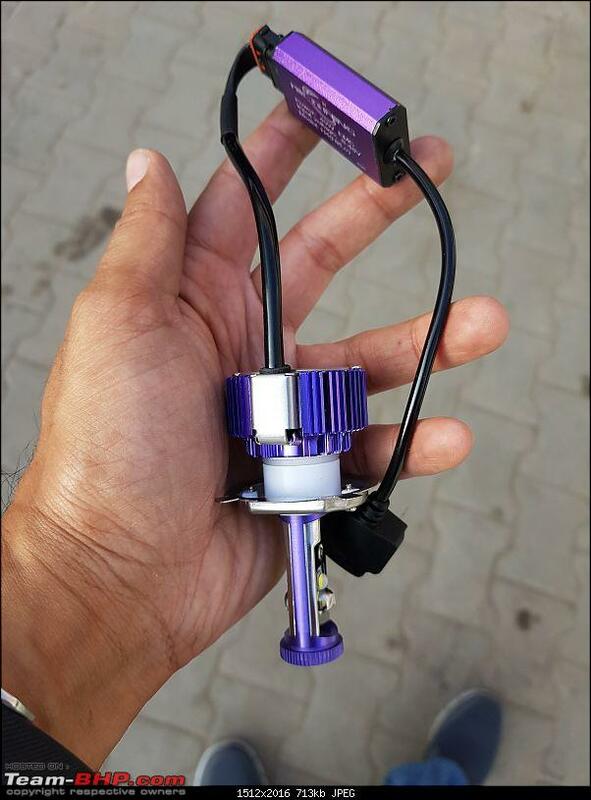 The light in itself is inserted afterwards otherwise the back fan and heat sink wont allow the clip to close. Pic of the low beam patter post install. You will notice that its missing the standard pattern of upward slant to the left. More on this later. But the cut is clean and there is minimal light spilling upwards which ensure onward traffic is not blinded despite the non standard beam pattern. High beam pattern. Basically all 4 LEDs turn on for high beam, which give a much brighter throw but can be quite nasty for onward coming traffic. few more pics of the low and high beam and a video to give a better perspective. You may have noticed the beam from the right light seems lower than left, this is inherent effect of the beam pattern the light has. To fix this I raised the right light a bit more than left to make it balanced on the road. Overall the result is significant improvement compared to the Osram night breakers I had. 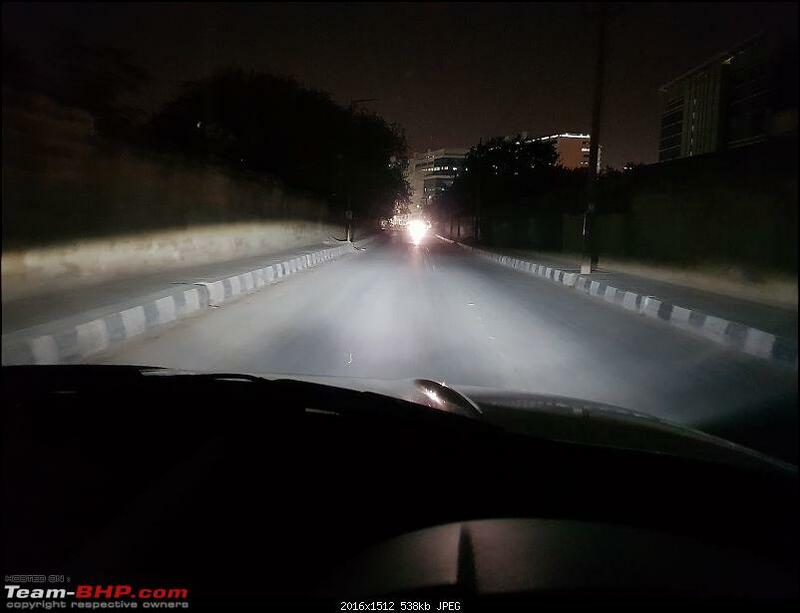 Biggest improvement is on high beam when both hi and lo LEDs are on and they illuminate the road very nicely. To quantify the overall brightness I did some Lux measurements on my phone using an app that reports light sensor reading. 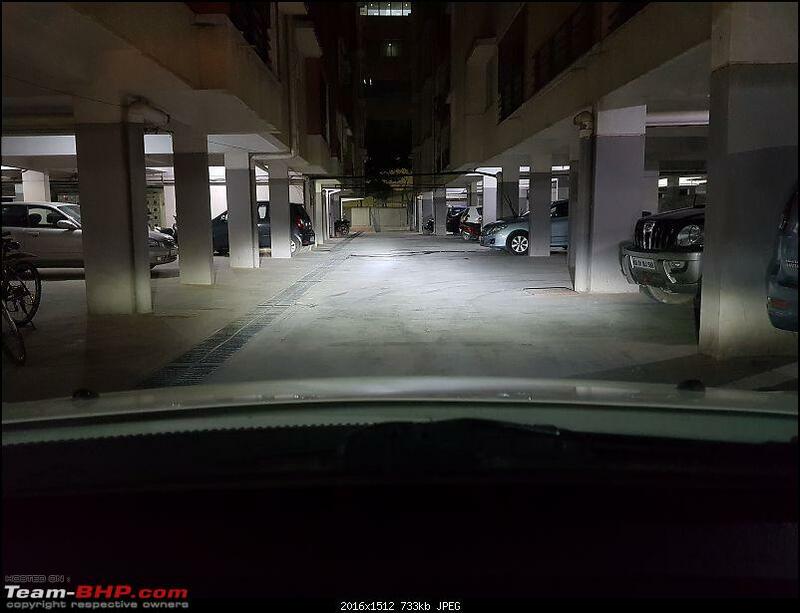 Parked the car at same spot before and after the change and measured the brightest spot at low and high beam. 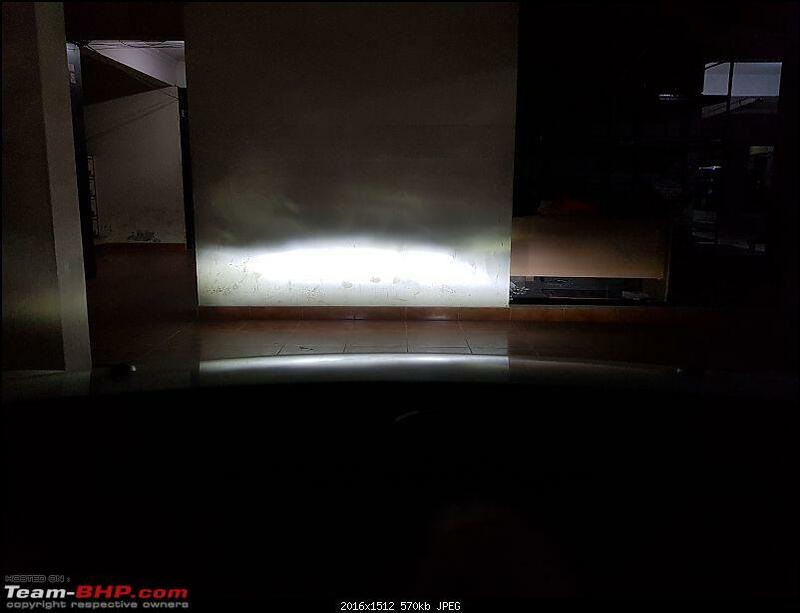 As expected high beam is way more brighter due to all LEDs being on, low beam is also better though not as significant as most brands advertise. 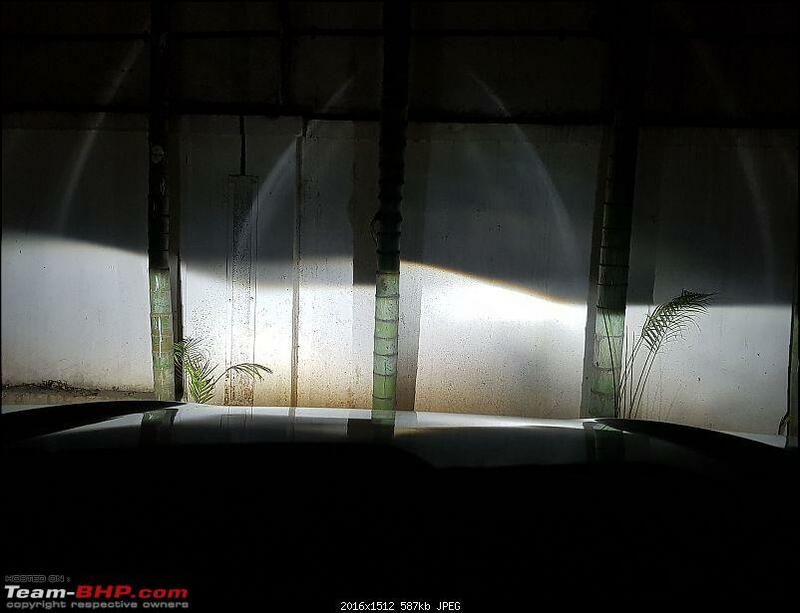 XUV low beam pattern post install. As perfect as it gets. Can you tell something is wrong? More on it later. 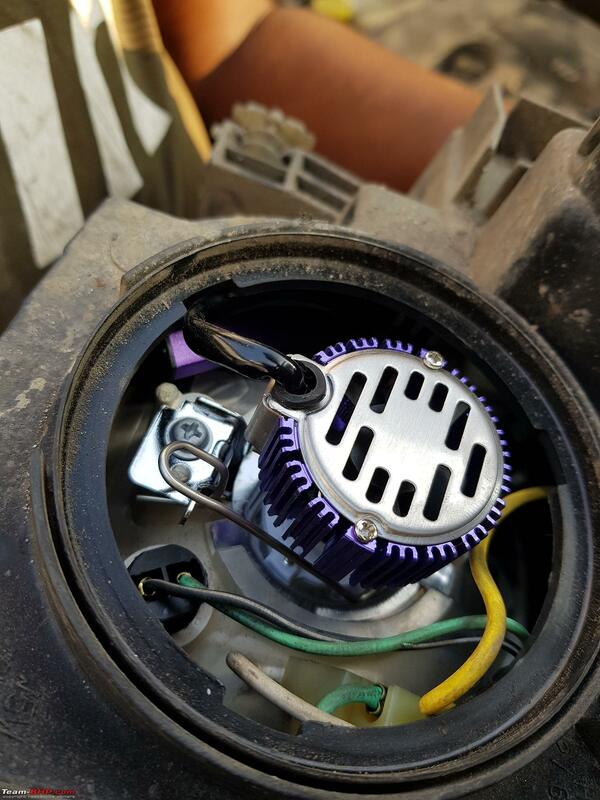 Heatsink with a fan and separate power supply - Best option in my view where everything goes inside the headlight assembly behind a dust cap/cover. Fan only has to cool the LEDs in itself and not the heat from power supply. Would keep things cooler. Hope this helps you guys in deciding whether you want to try your hand on it. Last edited by supertinu : 22nd July 2018 at 16:41. Thread moved from the Assembly Line to the Modifications Section. Thanks for sharing! Thank you for the detailed posts, and more so for the realistic points you have mentioned. I made the mistake of getting a cheap LED projector for my Vespa and learnt it the hard way. Thankfully Vespa is not ridden at night anymore. Same learnings I implemented in the Abarth as well. 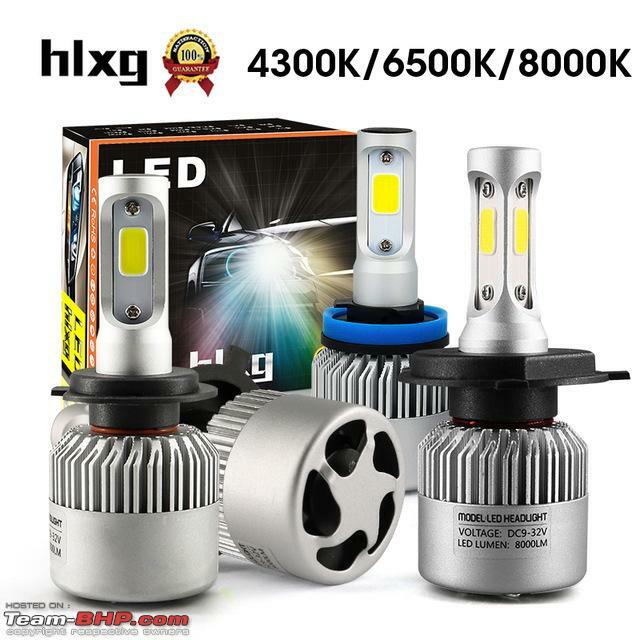 However, the high price of LED units and the minimal differential gain in throw / brightness compared to my setup made me stick with 90/100 bulbs on the main lights and a 35W bi xenon projector lamp in my fogs. 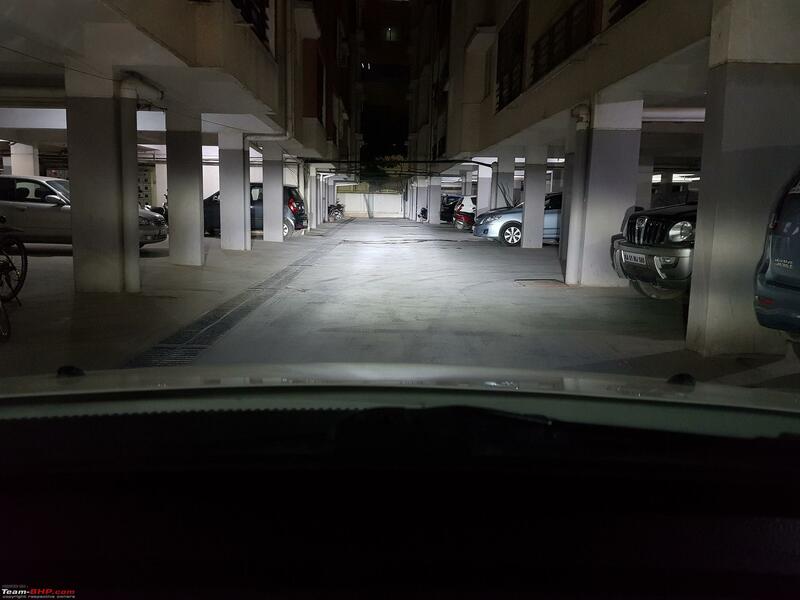 The biggest drawback of 90/100 setup is the high beam usage. No, I'm not complaining about the throw, but the relatively higher temperature than stock. 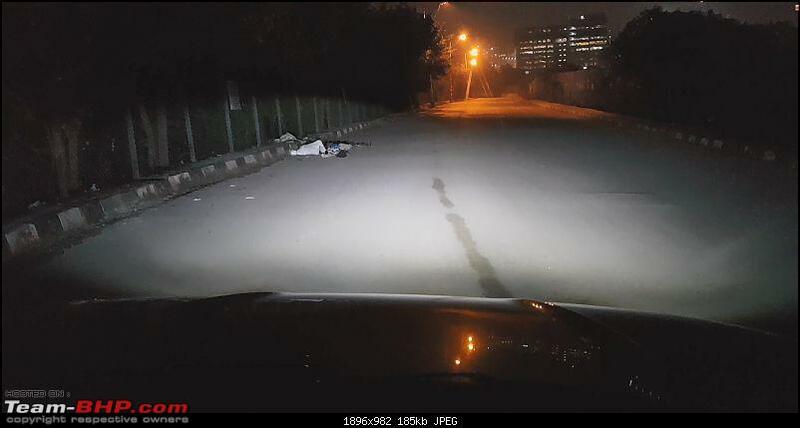 I rarely use high beams for more than 5 mins at a stretch. 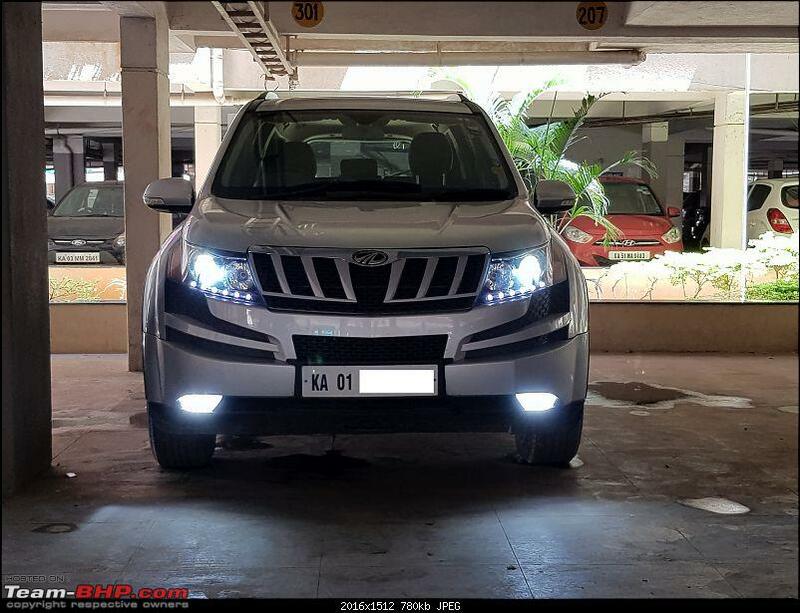 I believe that high beam should be the last resort i.e. just like driving the car at 80% of its capacity so that you have some reserve left over if needed. 90/100 allows me to do that. I don't recommend this setup to folks who use high beam extensively on highways. Seeing your throw images, I'm sure my next upgrade will definitely be towards the LEDs. Pardon me, but do we get yellow light LEDs? Hi Supertinu - Thanks for the informative post. 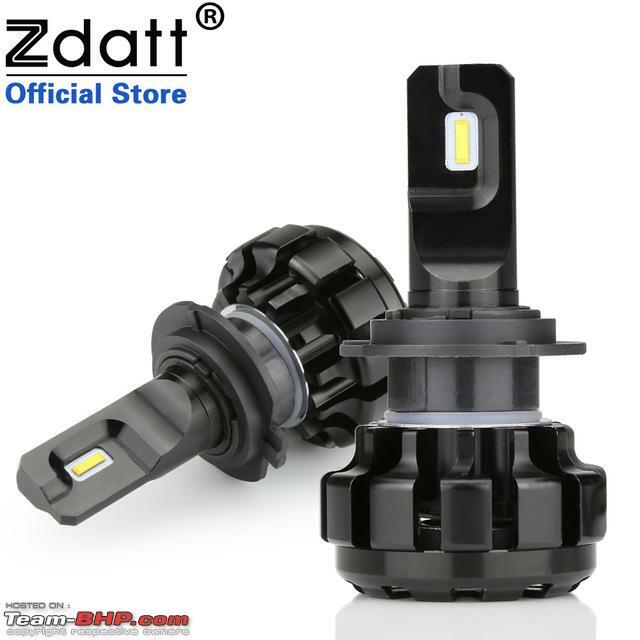 Quick question - I recently purchased a pair of H4 LED bulbs for my Ritz from Aliexpress. I just received the bulbs alone. 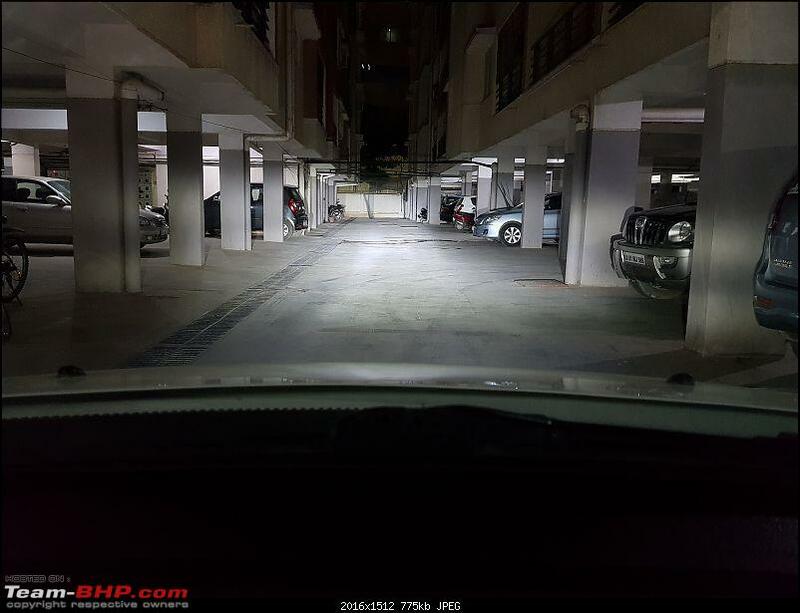 The bulbs were fitted by Bosch service centre and they function as expected. 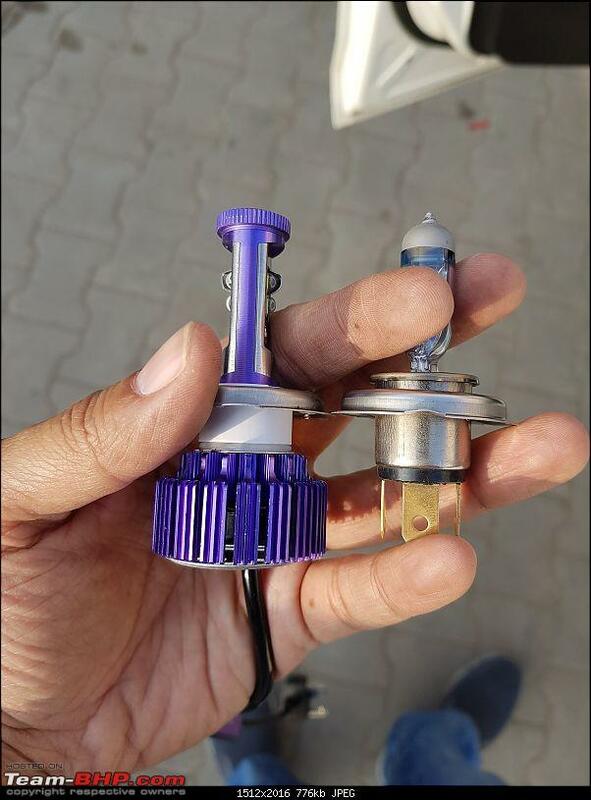 But, my question to you is - The seller didn't provide any Canbus system (or) Converter, yet the bulbs function. So, am I overloading the existing system? supertinu, first of all thank you so much for such a detailed and wonderful write up. 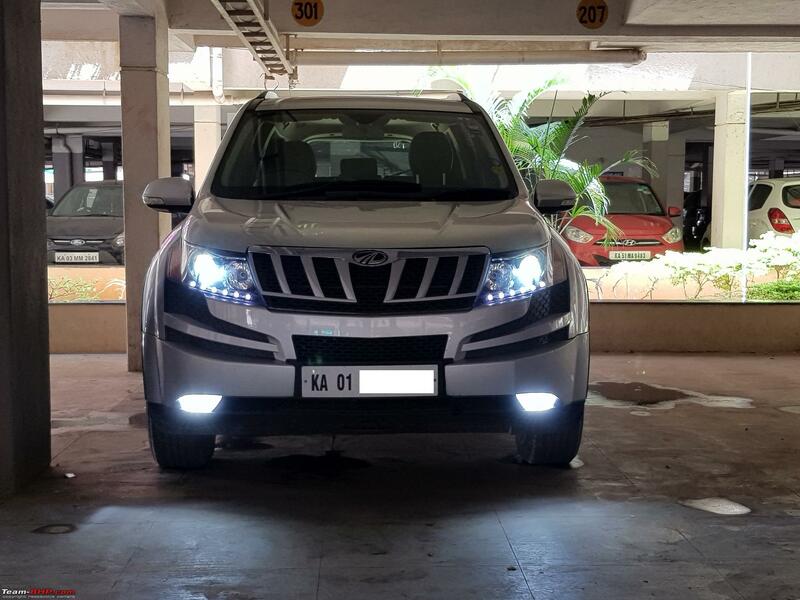 I too have been running LED setup on my Pajero Sports for more than 1.5 yrs and am very happy with the performance, especially so due to more bang for the buck you get with this upgrade provides. Instead of ordering from Amazon.com, I would strongly suggest you use Aliexpress, there are amazing options available for lower price. 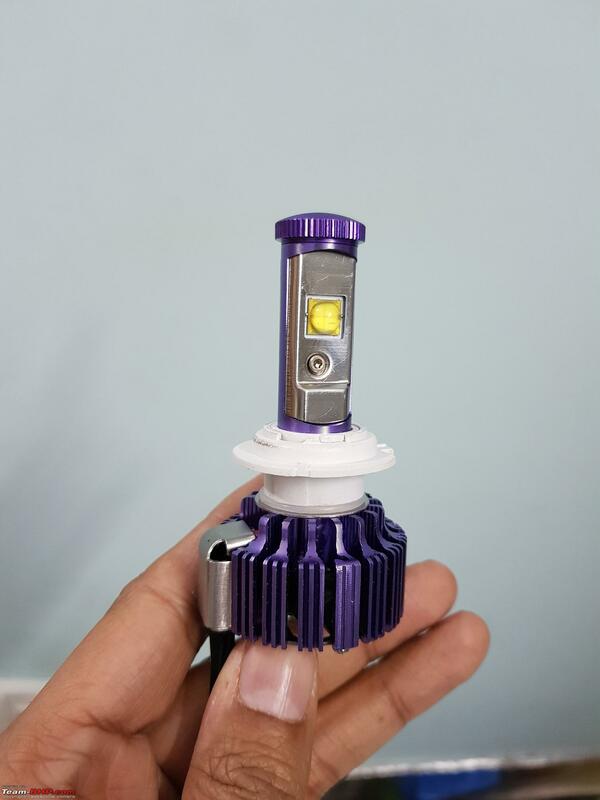 After a detailed study of products available on both sites, I suspect, USA vendors are sourcing LED headlights from Aliexpress and selling on Amazon.com at a marked up price. Below is what I have been using on high as well as low beams. 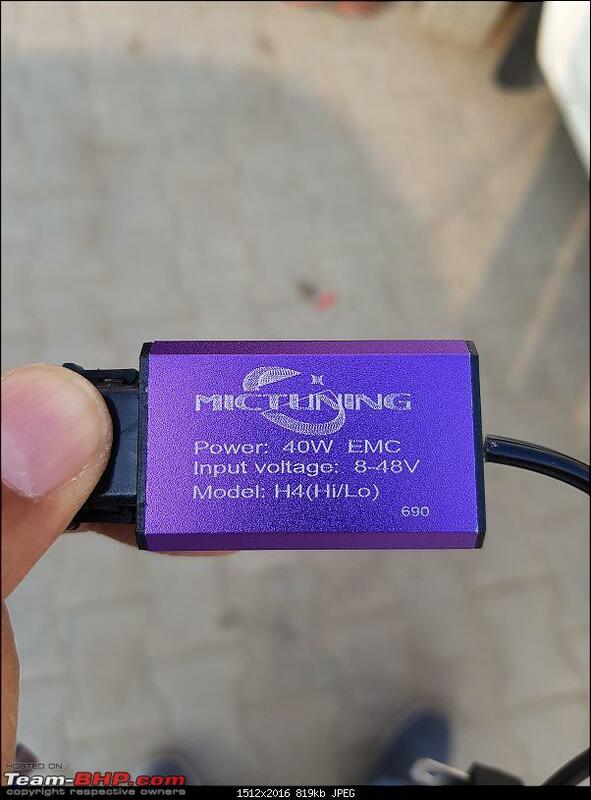 Here again, I would recommend Aliexpress very strongly. Have a look at below product I have ordered as an upgrade to my existing high beams. I have this setup running for 1.5 years and there are 10 more people who are using this setup based on my inputs for more than a year now and havent heard any complaint so far. 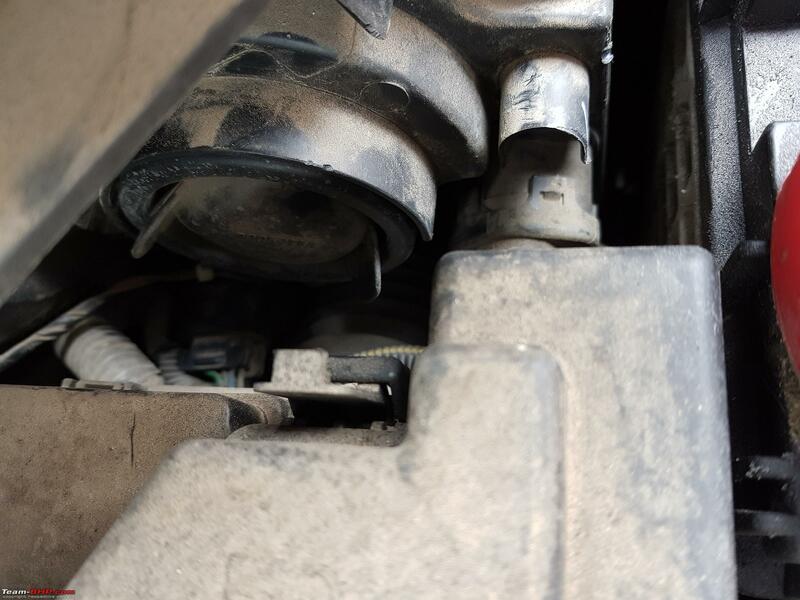 To me external power supply is a bit of worry as its one extra component hanging the engine bay which might get subjected to shocks and may break wires sometimes. Nope, you are all good. You dont have to worry a bit. 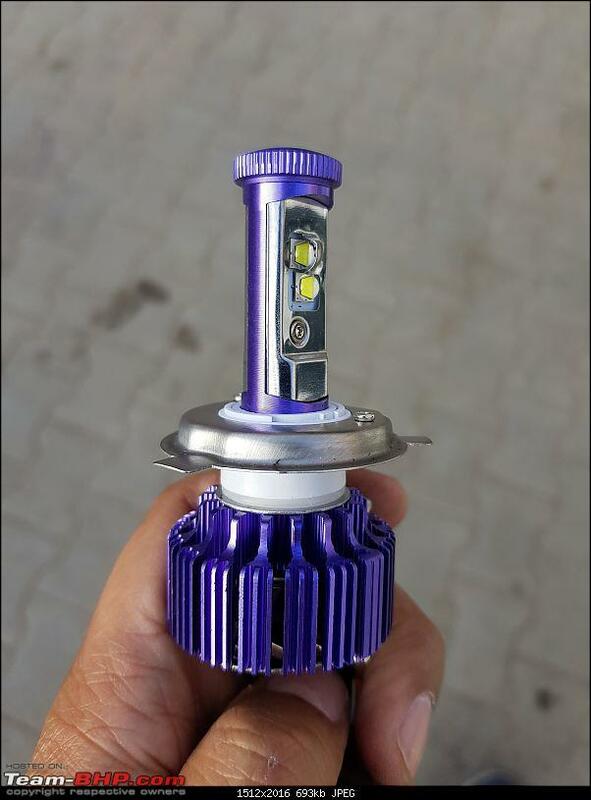 Some of the european manufacturers use Canbus for operating these lights. Canbus as such doesnt have any bearing on whether the existing system is over loaded or not, its just a protocol. So, only if you plug a bulb with higher wattage than specified in the existing setup then over load happens. For now, just relax and enjoy your LED setup. 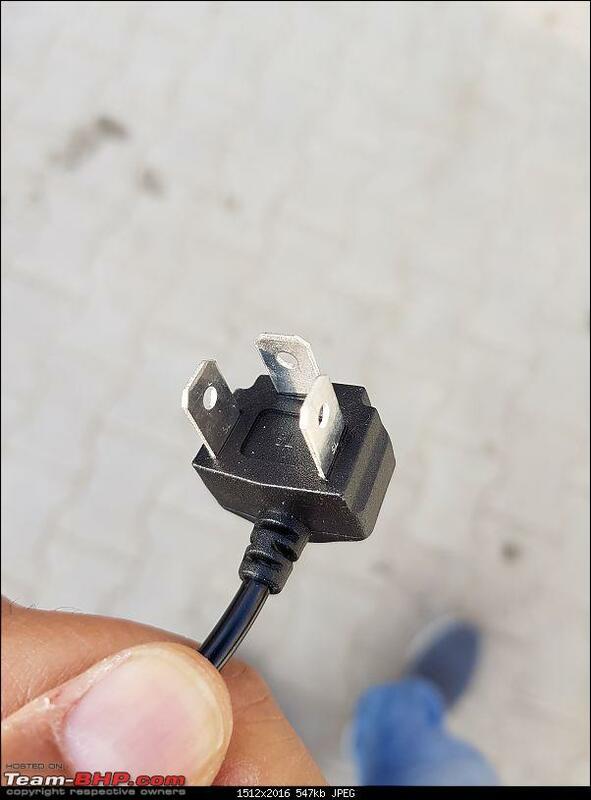 I guess you havent heard of AliExpress isnt it. 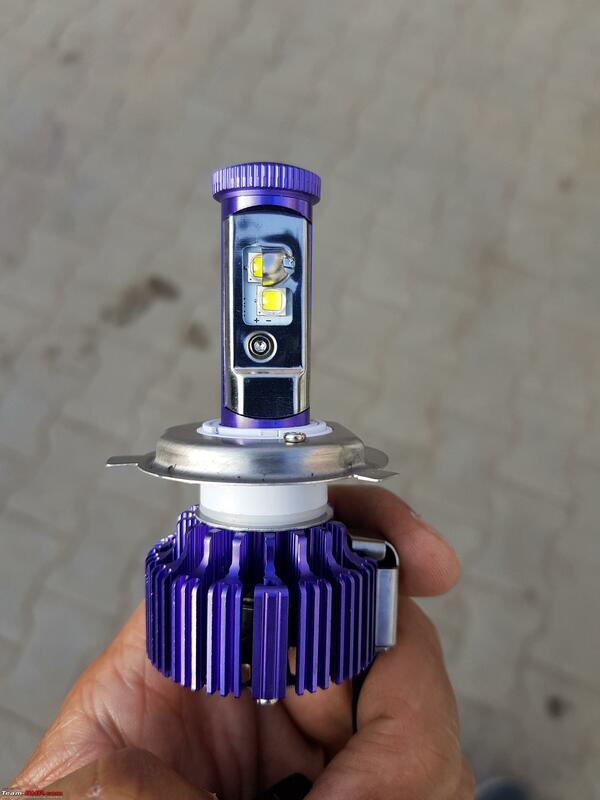 There are lot of LED headlights available there at a very cheaper price than what is available here locally or on some other websites like Amazon.com. 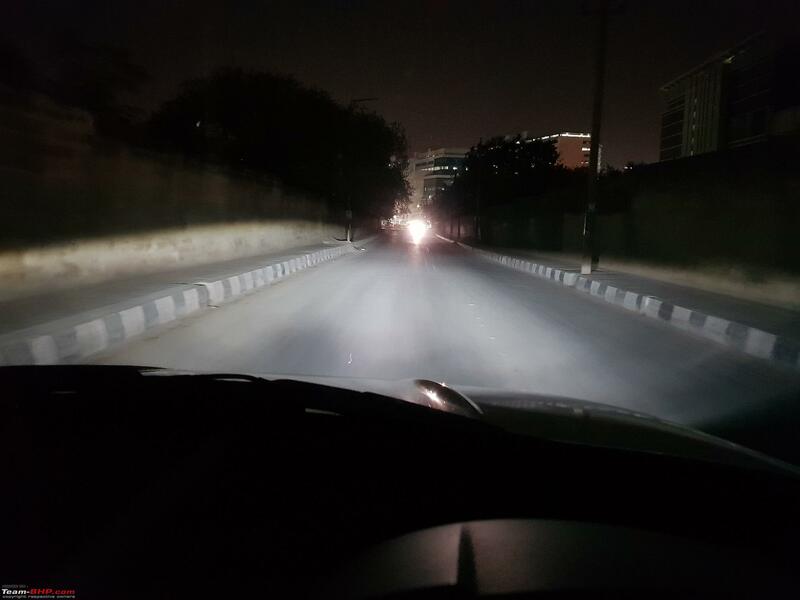 I would strongly suggest trying LEDs for your high beams if you are not too much worried about the white light in range of 6000K. You can check couple of links in some of the replies I have posted in this thread. Last edited by navin : 23rd July 2018 at 17:22. 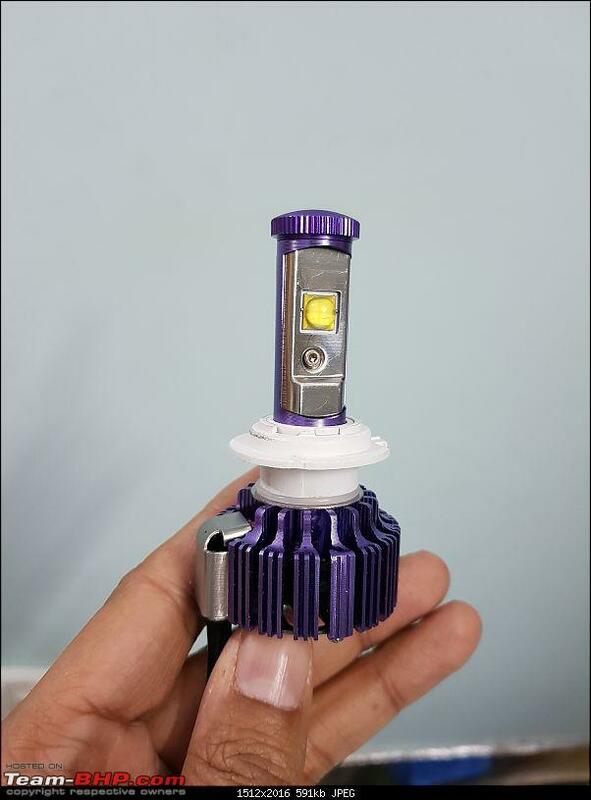 AliExpress has 3500k/4000k/4300k LEDs available. I've been toying with the idea of buying a set for the low beams in Linea as they are below par even with bulb upgrade. Last edited by theredliner : 23rd July 2018 at 16:34. 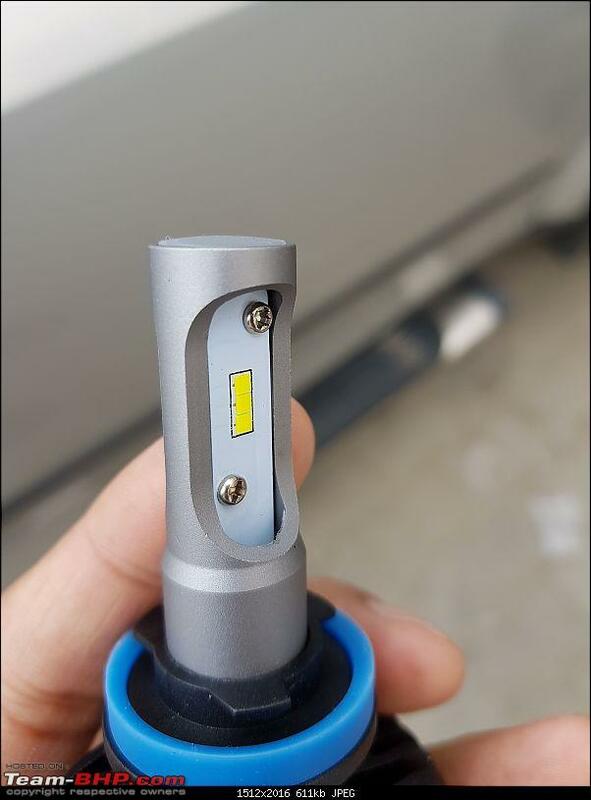 Thanks, I did order mat bi-xenon lights from Aliexpress. Its just that I'm not yet 100% convinced of LED bulbs in a conventional reflector. I'm ok in case of projectors or lights like Mercs and BMWs. IIRC, Linea has an H1 and H7 setup right? 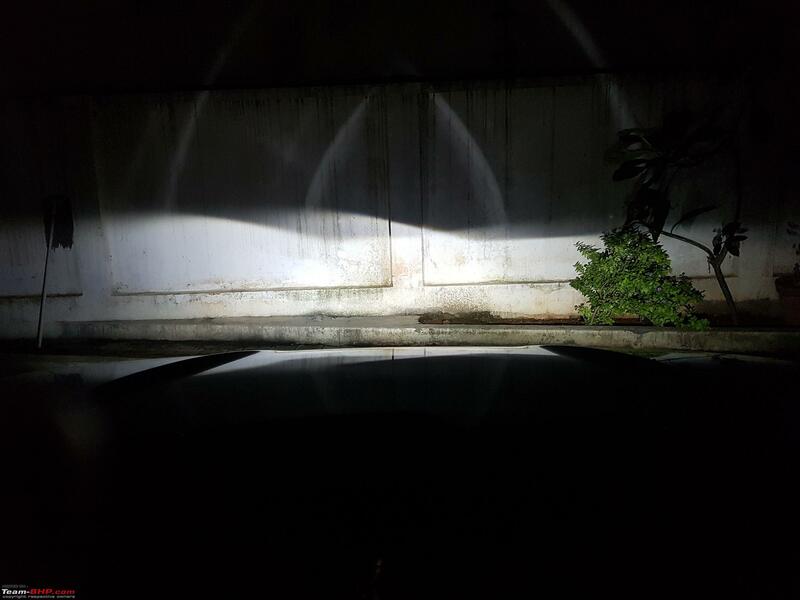 Why not try to get an 80W H7 bulb like this (low beam) with a Roots relay? There are amber colored ones available as well. Infact the mictuning lights i got also have a glass sleeve which makes them amber for fogs. However I found the amber color too orangish and not as close to halogens. I dont have much experience with other color ranges. Very true, all the ones selling on Amazon US are same as Aliexpress, as i wrote 100% are made in china ones. My reliance on US is cause warranties are honored more easily but if you want something in INdia directly then aliexpress is the best choice. The high beam model you shared is the same that I got for my low beams . 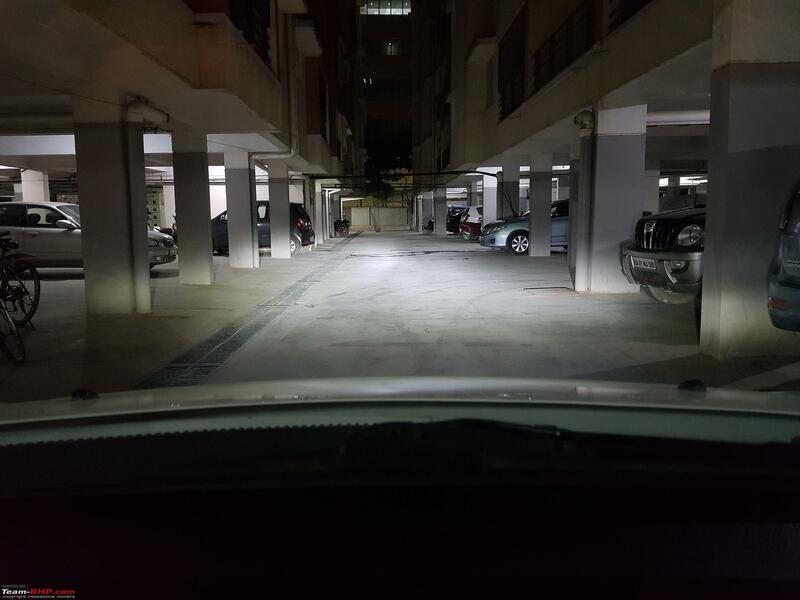 Btw the extra big groove on the black ones, dont they cause shadow in the throw for high beam. 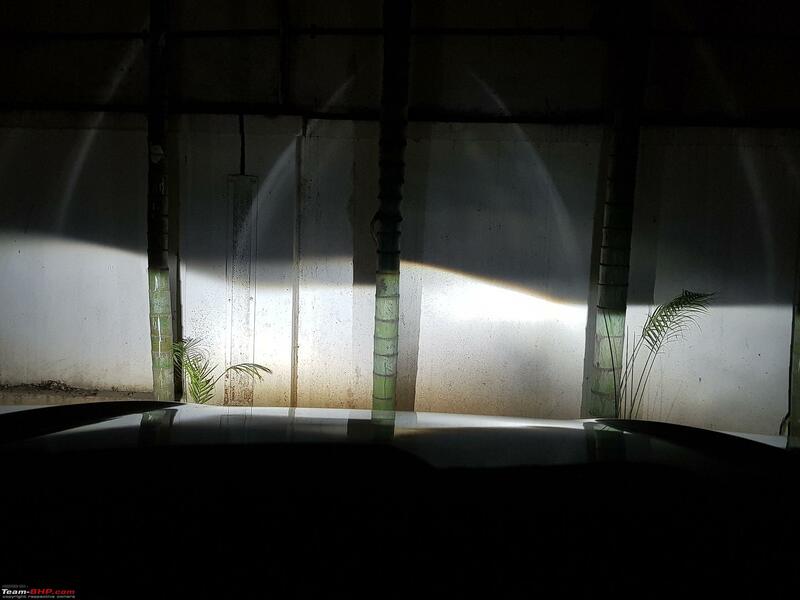 I use them for low beam and its ok cause the shadow gets cut off. I did have to rotate the holder 180 deg to get the shadow cut off. Thats good to know. 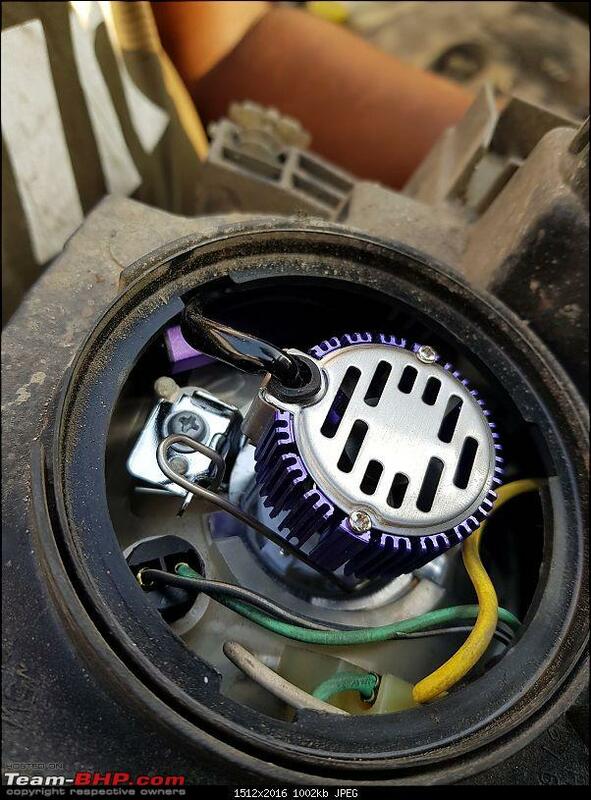 Is the fan exposed or inside the dust cap. Integrated light surely reduces an extra component but now you have the LEDs and the power supply all together getting hotter for sure. THere are lot of youtube videos show temp measurement and typically these would run hotter. But if designed well surely can work. Last edited by supertinu : 24th July 2018 at 00:52. Excellent thread Supertinu. Your findings matches exactly what I encountered when trying out multiple LED options. The CREE array 2x2 LEd with the dome just don't provide proper beam pattern as the light source is different. The 1x3 CSP LED's come the closest. 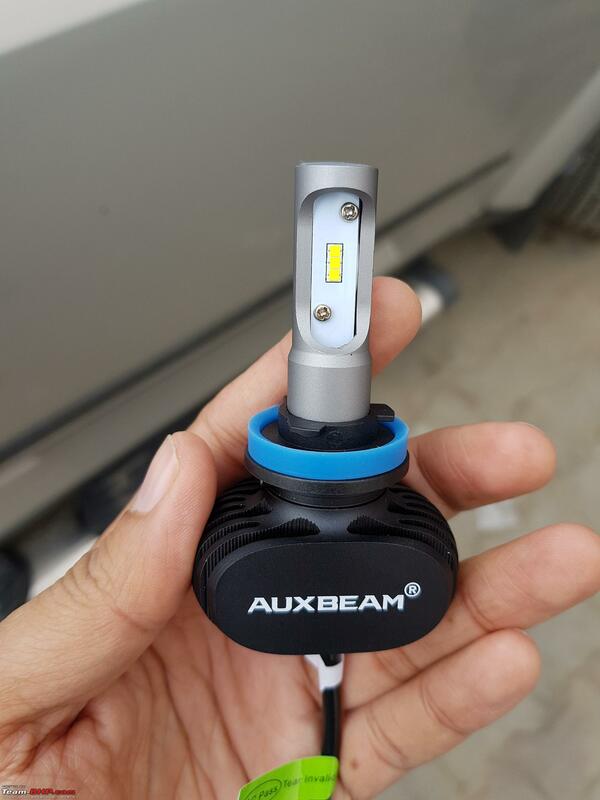 I narrowed down to the same conclusion and went for xenon depot lights which were way more than the Auxbeam. If anyone is coming down from US, I would recommend the Auxbeam or the Beamtech (both identical) LED. 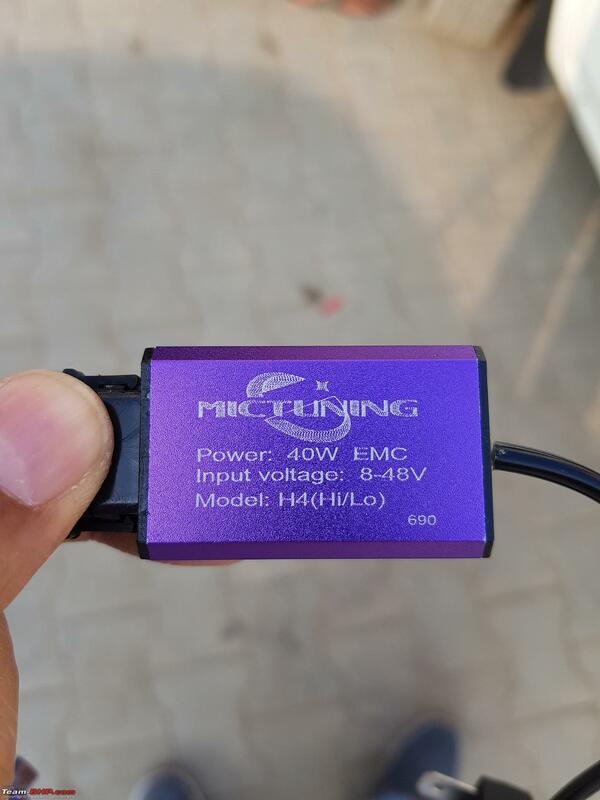 The reviews are really good and since they don't have a fan they will be more reliable. The ones with fan are known to fail in our dusty environment, especially if the fan is exposed. 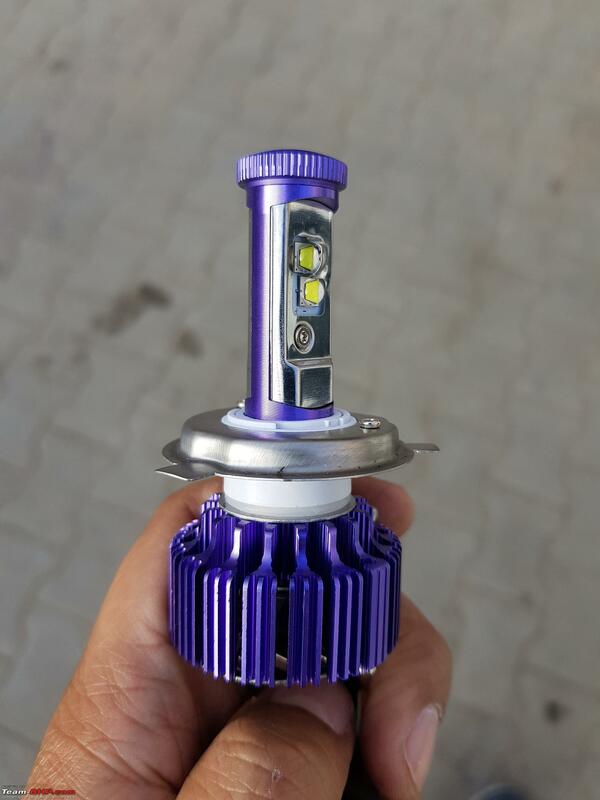 For the Figo H4 is a challenge in fitting since the entire LED assembly needs to fit within the headlight enclosure. The H11, H1 and H7 are so much simpler and really plug and play types. 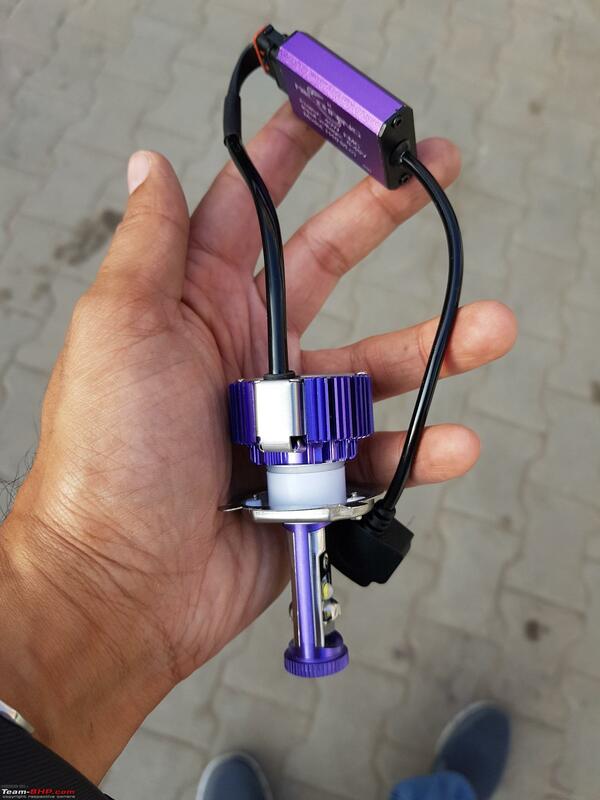 The high beam model you shared is the same that I got for my low beams . The first product shown in my earlier post is what I have in both my hi and low beams. I didnt face any shadow or focusing problems with those. The second one with the groove, which you are referring to, I have ordered it recently and yet to receive it. 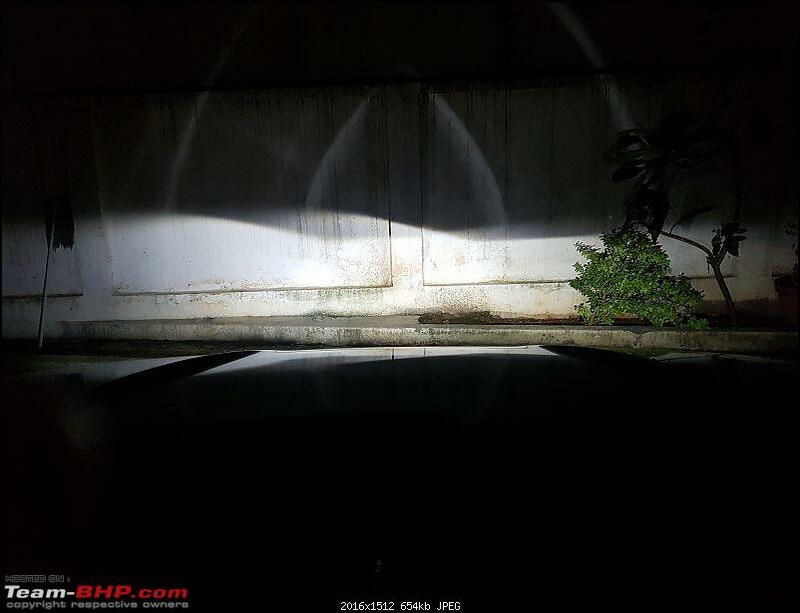 Pajero Sports has a reflector setup for hi beam, so I guess I will most probably face the problem you have mentioned. Will share results once I try out this product. Thats good to know. Is the fan exposed or inside the dust cap. 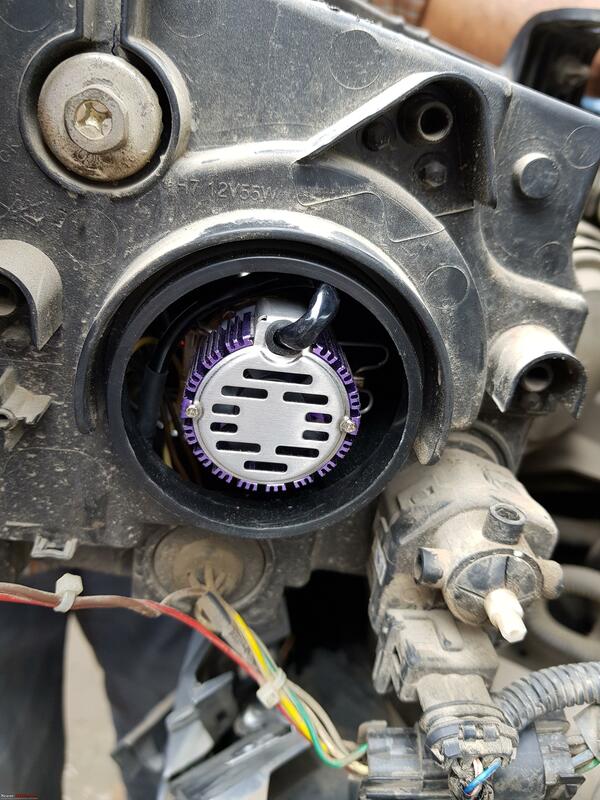 Yes, fan is open to engine bay and is exposed to dust. I can see there is some dust accumulated but its been going good so far. Hopefully it stays that way. In the same context, has anyone tried the Philips x-treme Ultinon LED Headlamps? Yes. Linea has H1 and H7. I had thought about upgrading to higher wattage ones, but dropped the plan as I was concerned about reflector damage due to the extra heat and ended up buying 55W X-treme Vision +130%. 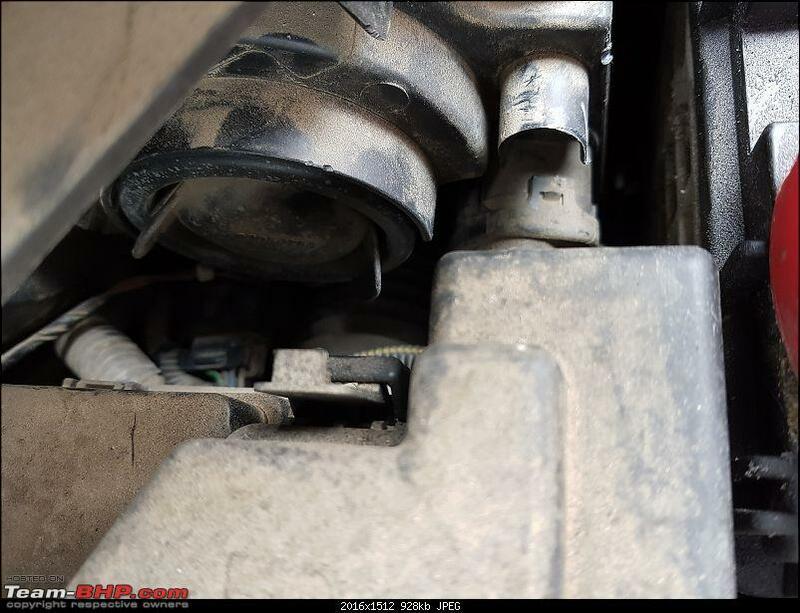 Have you noticed any reflector damage due to higher wattage bulb in your Abarth? Last edited by theredliner : 24th July 2018 at 15:26. None, but only because I'm careful of using the high beam. My old Punto too had such a setup and lasted well over 5 years without any issue before we sold off the car. In Abarth, there is no damage to reflector since I brought her home in 2016. Further, the Linea having 2 separate bulbs, hear dissipation would definitely be better than Punto. 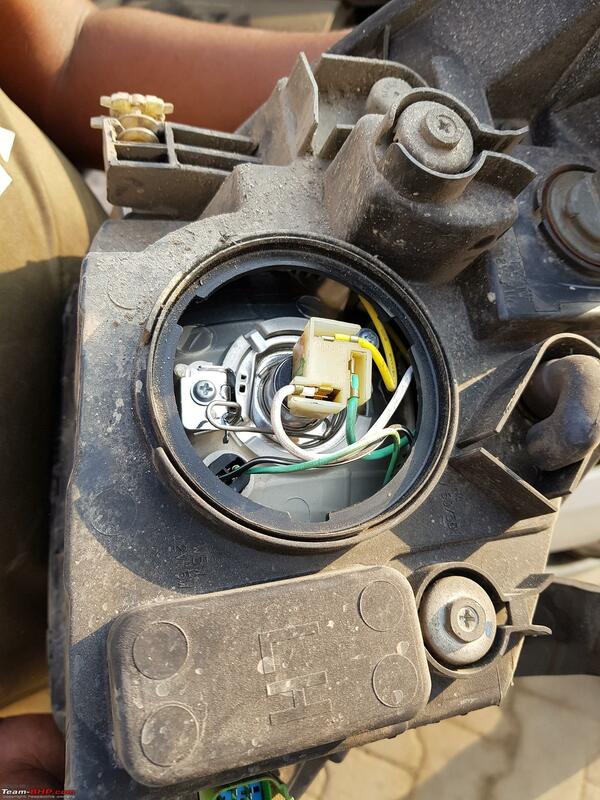 How did you plug the open rubber gromet in the XUV? Hey Vid, yes look like we pretty much went through similar experience in parallel. 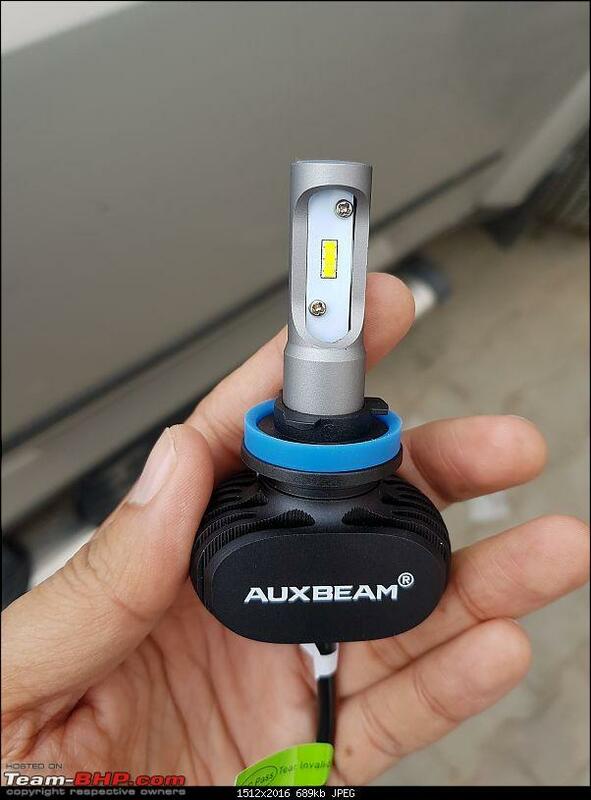 You are right BeamTech and Auxbeam have the same sourcing mostly. Figo headlights actually have lot of space between the body and reflector, so fitting it all inside was relatively easy. Also periodically you can use compressed air to clean the fans, that should give them longer life since they are exposed. 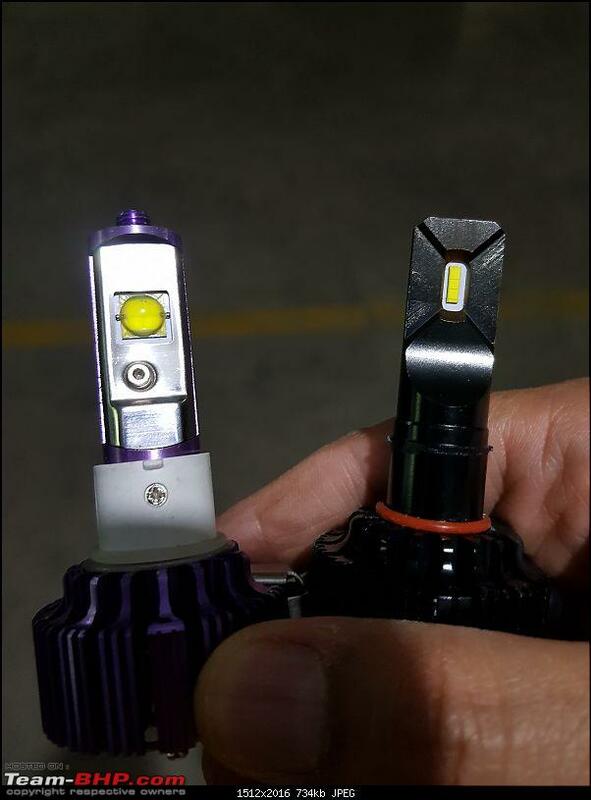 Maybe what you can do is use the black ones for low beam only. Inside the projector if the groove is facing down it wont cause shadow, but in high beam with reflector it will create a dark spot. Ravi, i am not sure i understood your question. The LED lights dont protrude out, so the back rubber cap fitted with ease. 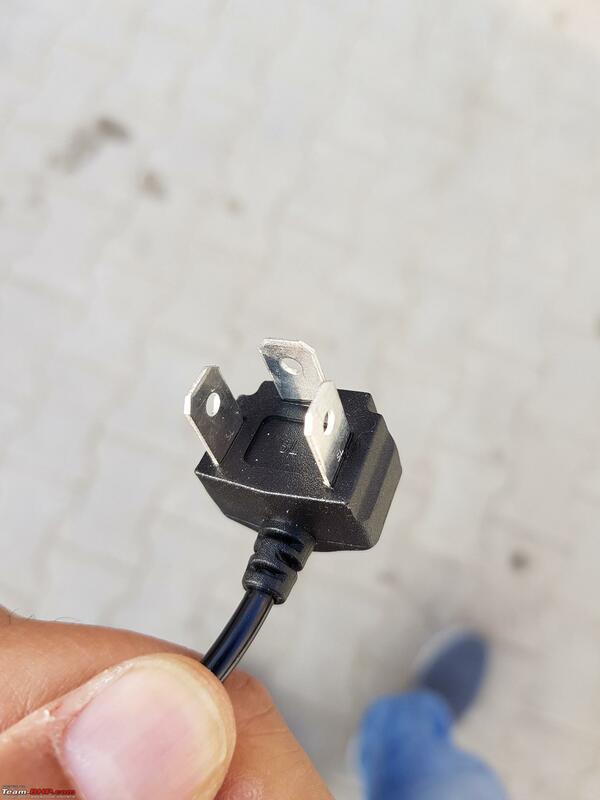 I kept the power supply also inside. Last edited by supertinu : 24th July 2018 at 22:19.